G3 Defibrillator - The next generation Powerheart AED has arrived. The Powerheart AED G3 is our flagship, feature-rich AED offering. The innovative Powerheart AED G3 presents our new customer-friendly features such as more instructive voice prompts, improved voice quality, new lighter weight, redesigned form factor, and the industry's first four-year, full replacement battery. G3 Auto Defibrillator - The revolutionary Powerheart AED G3-Automatic simplifies the rescue process by eliminating the need to press a shock button. All that you have to do is attach the device to a person in cardiac arrest. 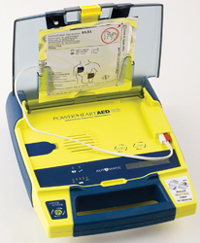 Once the defibrillation pads are attached to the patient, the device detects the person's heart rhythm, analyzes the rhythm using the patented RHYTHMx® software, and if a life-threatening rhythm is detected, instructs the user to stand clear and automatically delivers a defibrillation shock. G3 Plus Defibrillator - The Powerheart G3 Plus AED offers a unique combination of features that no other AED can match in providing an easy to use, reliable and technologically advanced lifesaving device. New, Rescue Coach intuitive voice prompts were designed using the results of a human behavior study to guide the rescuer confidently and easily through the rescue process and provide instructions and AED behavior aligned with the AHA/ERC 2005 Guidelines. Patented Rescue Ready® daily, weekly and monthly self-tests ensure that critical components such as pads, battery and internal circuitry are always in working order and validate reliability. 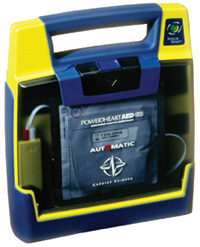 Another unique feature for Powerheart AEDs is the monthly full-energy self test which confirms that the AED can charge to its maximum capability. passed its last self-test and is ready for use. FR-X Defibrillator - The Philips FRx Defibrillator is the newest member of the HeartStart family of defibrillators designed with new technological advancements to help in treating the most common cause of SCA. demanding for many other defibrillators. anyone else stricken with sudden cardiac arrest. 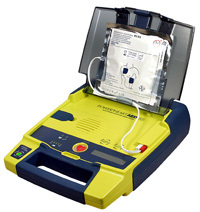 defibrillator can be easily carried to the victims side. defibrillation. And like all HeartStart Defibrillators, it can be used to treat infants and children as well as adults.